Biotique is based on 5000-year- old Ayurvedic recipes known to integrate and celebrate body, mind and spirit. This is the heritage and harmony of all Biotique products, blending proven Ayurvedic therapies with the science of 21st century bio-technology. An extraordinary combination of ancient/modern therapies and sciences that balance the wonders of nature to support healthy well-being and spiritual bliss in your life. 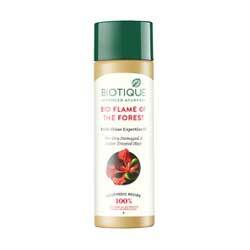 Bio Flame of the Forest Fresh Shine Expertise Oil For Color Treated & Permed Hair. Flame of the forest is a beautifully brilliant tree that produces medicinal scarlet flowers when it blooms. This luxurious oil is a blend of flame of the forest flowers and extracts of hibiscus to promote healthy hair shine and body. Fortifies follicles against damage. Keeps color and perm in place. Leaves hair full of life and luster. Tesu (Butea frondosa) 2.0%, Shikakai (Acacia concinna) 0.5%, Japapushpa (Hibiscus rosa sinensis) 2.0%, Aam beej (Mangifera indica) 0.3%, Amla (Embelica officinalis) 1.0%, Moongphali (Arachis hypogaea) Q.S.